How can dogs be exposed to HABs? Contacting any affected water body including lakes, rivers, or ponds. Because animals are attracted to cyanobacteria (blue-green algae), they drink the water and eat algal material. Dogs in particular lick algae caught in their fur after being in the water. Consuming water and algae from residential pools or decorative ponds. Ingesting blue-green algae health supplements. Check if a waterbody has a reported bloom by checking the HAB Reports Map, contacting the waterbody manager, and looking for posted advisory signs. Check to see if the water has a scum, algal mats, or is discolored. Do not let your dog drink, wade, or swim in HAB-affected water. Do not let your dog eat scum or algal material. Wash your pets with clean water after lake or river play. Provide clean drinking water. Animals can experience symptoms within minutes to days following exposure to the cyanobacterial toxins (cyanotoxins). Symptoms they might experience include vomiting, diarrhea, weakness, difficulty breathing, seizures, or death. In 2017, there were 18 reported dog deaths from suspected HAB-related exposures in California. If your pet experiences these symptoms after exposure, contact your veterinarian immediately. A veterinarian fact sheet is available. For additional assistance, contact the 24-hour ASPCA Animal Poison Control Center hotline at (888) 426-4435. A $65 consultation fee may be applied. How can livestock or other large animals be exposed to HABs? 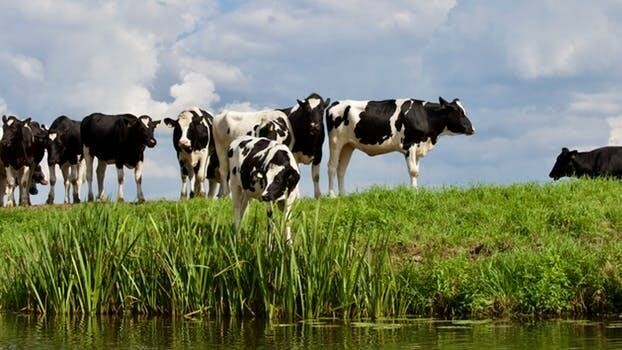 Livestock can be poisoned by ingestion of algal material either in the water or as dried mats on the shore, or from drinking water where algal decay has released considerable toxins into the water. Sheep are more likely to be affected than cattle as they tend to drink from the edges while cattle often wade into the waterbody. Ingestion of blue-green algae supplements can be a potential source of cyanotoxins. How can I keep my livestock and other large animals safe from HABs? Livestock water supplies should be checked daily in summer and autumn for algal blooms. Treat all algal blooms as possibly toxic to livestock and prevent stock access unless the algae are identified and the level of toxin determined. Avoid administering blue-green algae supplements unless shown to be free of cyanotoxins. What are signs of possible cyanobacterial toxin poisoning in livestock or other large animals? Poisoning will depend on cyanotoxin levels present and ingested, the susceptibility of the livestock, and the amount of food in the animal’s gut, which will help counter the effect of the toxin. All animals are at risk of poisoning from cyanotoxins. In North America, cyanotoxin poisonings in cattle, horses, sheep, pigs, chickens, and turkeys have been reported. Most of the poisonings were fatal and were associated with visible scum of cyanobacteria. More information is available from the Western Australia Government webpage on livestock poisoning from algal blooms. Resources are available to assist veterinarians to respond to incidents of suspected HAB-related illness in animals. The California Water Boards provide limited funding for confirmatory testing of HAB-related poisonings in canines, and can assist with HAB identification and early response in suspected exposure areas. State or local agencies can post warning signs at hazardous waterbodies to prevent additional animal poisonings. CLINICAL SIGNS, DIAGNOSIS and TREATMENT: See the 2017 Veterinarian Reference. Apply for funding by completing the Illness Information Section of the HAB Portal bloom incident form. REPORTING: Reporting confirmed or suspected cases will help prevent other animal and human exposures to cyanobacterial toxins. Please complete the Illness Information Section on the Freshwater Bloom Incident Report Form. The following resources are available for printing and distribution. Limited hard copies may be available upon request to CyanoHAB.reports@waterboards.ca.gov. The California Environmental Health Tracking Program at the California Department of Public Health (CDPH) or the Office of Environmental Health Hazard Assessment (OEHHA) will contact veterinarians to request additional health information on the affected animal. CDPH is implementing California’s HAB-related human and animal illness reporting to the Centers for Disease Control and Prevention (CDC) One Health Harmful Algal Bloom System (OHHABS).